The following table shows the voter turnout (percentage of registered voters who cast a ballot) in each of Niagara’s electoral districts in the 2015 Federal Election. Comparative figures are also shown for overall voter turnout in Niagara and across Canada. Voter turnout figures by electoral district are available but are not shown below due to a reconfiguration of electoral districts. There was a significant spike in voter turnout in the 2015 federal election in Niagara and across Canada as a whole. While previous municipal, provincial, and federal elections saw a voter turnout in the range of 40-60%, the 2015 federal election drew nearly 70% of eligible voters across Canada, and 67% of eligible voters in the four electoral districts in Niagara. The following table illustrates voter turnout (percentage of registered voters who cast a ballot) in each of Niagara’s electoral districts in the 2014 Provincial Election. Elections Ontario. (2014). Official Election Results [Data file]. The following table shows the voter turnout (percentage of registered voters who cast a ballot) in each of the lower-tier municipal elections in Niagara for 2014, compared to the four prior municipal elections. 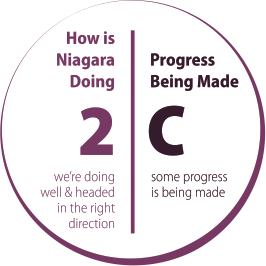 The average across the Niagara region is also shown. Further details can be found at each lower-tier municipality’s website. Source: Municipality websites. Table compiled by Niagara Connects, Living in Niagara–2017 report.